There are some quick and easy comfort foods that I miss every now and then. Spaghetti is one of them. When we went paleo, we tried to find a substitute for wheat pasta, but the rice noodles we tried were all mushy and blah. Then we discovered spaghetti squash, the standard paleo substitute. It’s called spaghetti squash because when its cooked, the squash shreds like – you guessed it – very short spaghetti noodles. Here’s how to make a fantastic spaghetti substitute. 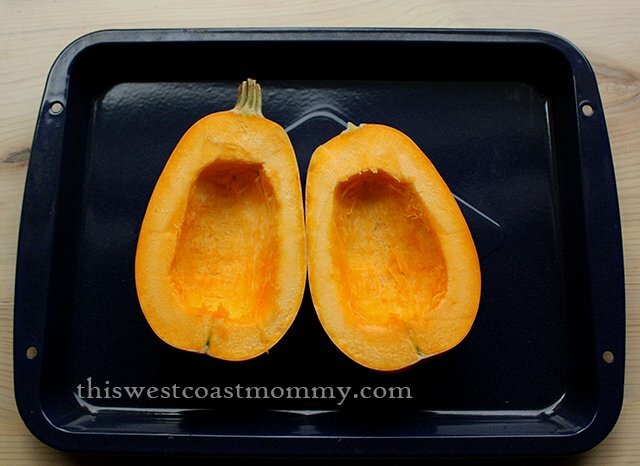 Slice your squash lengthwise in half and clean it out. You can roast the seeds just like pumpkin seeds if you want. Yummy! Bake the squash face down on a cookie sheet for 30 minutes to an hour, depending on the size of the squash. It really does vary that much (and wreaks havoc on my meal timing!). It’s done when the squash is soft and you can scrape out the inside with a fork, forming spaghetti-like strands. Be careful not to overcook the squash or the strands will be too wet and leave a puddle on your plate. Start checking at about 30 minutes and keep cooking it as needed. When it’s done, the “spaghetti” looks like this. 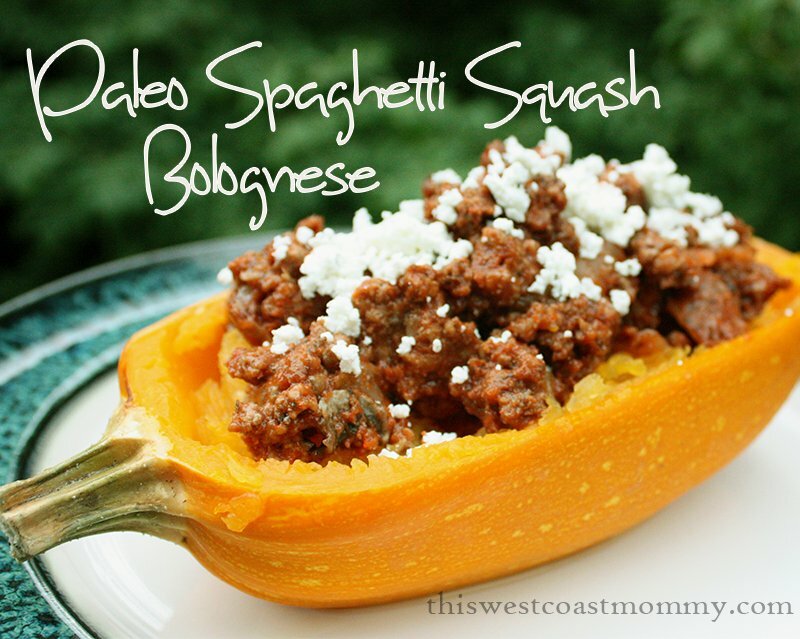 While your squash is baking, make up the Bolognese sauce. Saute diced onion in coconut oil over medium heat. Once soft, add 4 or 5 cloves of minced garlic and saute another minute or so. Add 2 pounds ground beef and 6 rashers of chopped bacon and cook until beef is browned. Drain the excess fat then mix in 2 and a half cups of tomato sauce (about one and a half cans) and 1/2 cup tomato paste. Add 2 teaspoons balsamic vinegar, 3 sprigs fresh rosemary, 2 stalks (8-10 leaves) of fresh basil, and 4 dried bay leaves. Then add your spices: 1 teaspoon each of thyme oregano, garlic powder, cumin, ground ginger, chipotle chili powder; 2 teaspoons chili powder; and a quarter teaspoon of ground cinnamon to warm everything up. We like a little spice in our sauce, but feel free to reduce or leave out the chili powders entirely. Season with salt and ground pepper to taste. Simmer on low for at least 30 minutes so the flavours can mix and deepen. The sauce will thicken as it simmers. I like to throw in some sliced mushrooms about 5 minutes before serving for some extra yum! For an extra touch of fancy, put the shredded squash back in the hollowed out shell. Add your Bolognese sauce on top, then sprinkle with cheese if desired. Since hubs can’t eat cow dairy (no Parmesan, boo), we use soft, unripened goat cheese on top. Herb-flavoured goat cheeses are especially good. I used garlic and parsley goat cheese here. Leave out the cheese to make this Whole30 compliant. Slice spaghetti squash lengthwise in half and clean. Bake halves face down for 35-50 minutes. Squash is done when soft and inside shreds easily. Use a fork to scrape out the spaghetti-like strands. Heat coconut oil over medium heat. When shimmering, add diced onion and saute until translucent. Add minced garlic and saute one minute. Add ground beef and chopped bacon. Break up beef and cook until browned. Add tomato sauce and tomato paste. Stir well. Add balsamic vinegar, fresh herbs, and spices. Mix well and simmer on low for at least 30 minutes for sauce to thicken. Stir occasionally. Add sliced mushrooms 5 minutes before sauce is done. Add meat sauce to spaghetti squash and sprinkle Parmesan or soft goat cheese on top if desired. This looks absolutely delicious – and what a healthy alternative to pasta! I’m going to have to try this! Thanks, Jennifer! Please let me know how it turns out if you do! 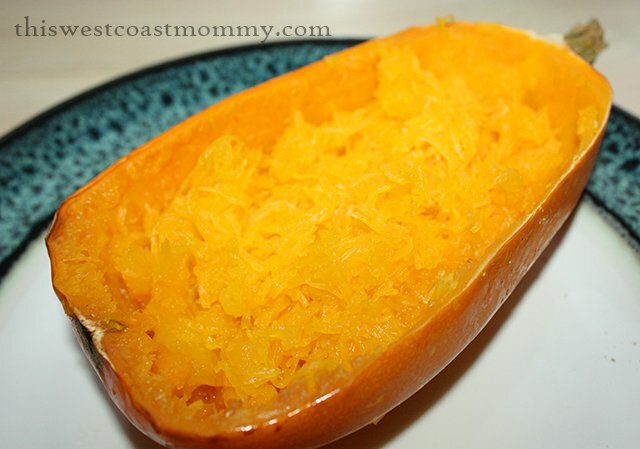 I’ve never tried spaghetti squash, but if it’s anything like spaghetti, it’s worth a try!! Your recipe really does look yummy. Honestly, it isn’t anything like spaghetti other than the shape. I think people might be disappointed if they go in thinking it’ll taste like pasta. You have to try it and appreciate it on its own merits. It really is very tasty! looks good and I love how you served it in the squash ! Sounds wonderful, I’ve never tried to cook spaghetti squash so I think this recipe will walk me through the steps quite nicely. Thank you for linking up with our weekly Tasty Tuesday linky. Thank you, Bonnie! I know it’s not a typical dinner which is why I added extra pictures to show how the squash should look. I’m glad you found the pictures helpful. We LOVE spaghetti squash, but this is unlike anything I’ve ever made before! Must try this with the next spaghetti squash I buy! I have been wanting to try spaghetti squash for a long time now but keep chickening out. Your recipe with this amazing sauce looks like one I have got to try. Thank you so much for sharing it with Delicious Dish Tuesday. 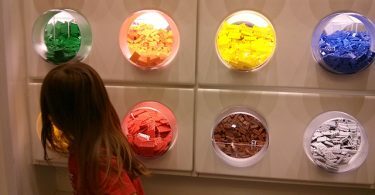 I have featured you in this week’s post! Thank you for featuring me! 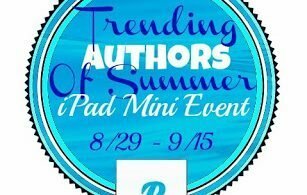 I’m linking up again this week. Wow! I love to use spaghetti sauce as a healthier alternative to noodles, but I’ve NEVER made a sauce like this; I’m expecting a very complex and rich sauce to compliment the light squash. The house smells amazing! Thanks, Kristine! I hope you enjoyed your dinner! That looks great! It does look really fancy served in the squash rind. So hungry and this looks amazing!! Myn husband would love this recipe, I’ve just got to try this.